How Much Can California Ask of Its Rivers? California is finally embracing its rivers. But it may be a choking embrace. We Californians have long celebrated our coastal splendor and toasted the height and beauty of our mountains. But our rivers? For most of us, they have been a mere utility, the plumbing that moved water around the state. California’s crowded communities, seeking space for environmental restoration and recreation (and some desperately needed housing), are treating rivers and riverfronts as new frontiers, and are busily reconsidering how these bodies of water might better connect people and places. There is good and bad to California’s belated appreciation of even its lesser-known rivers, from the Klamath in the north to the San Diego in the south. A massive state bond passed in 2014 offers billions for water-related projects, and the state’s epic drought is inspiring imaginative thinking about our waterways. But the new thinking is also opening up broad new conflicts that go beyond the famously difficult issue of water. So many California places now are making so many plans for so many rivers that we may have to ask just how much change our rivers can handle. So many California places now are making so many plans for so many rivers that we may have to ask just how much change our rivers can handle. Some of these conflicts are bigger, updated versions of older battles. The so-called California Water Fix—Governor Brown’s much-touted plan to build two tunnels under the Bay Delta—is really just another chapter in a decades-long battle over how the state manages its longest and most important river, the 445-mile Sacramento. The tunnels would reroute water from the Sacramento, which otherwise would go into the Delta, to the south, in the name of creating a more predictable, if not larger water supply for the San Joaquin Valley and Southern California. The newer—and, potentially, nastier fight—involves the river that, with the Sacramento, helps form the Delta: the overtaxed San Joaquin. New efforts by the state to help restore fish and wildlife species by leaving more water in the San Joaquin and its vital tributaries—the Merced, Tuolumne and Stanislaus—represent perhaps the signature battle in this new era of river appreciation. The environmental advocacy group American Rivers has called the San Joaquin “the hardest working river in California” with good reason. The river and its tributaries are part of the landscape of Yosemite and Kings Canyon National Parks, support abundant wildlife and a Pacific salmon fishery, supply some of the world’s most productive agriculture, power four million homes, provide recreation from whitewater paddling to waterfowl hunting, and deliver drinking water to 25 million Californians. But the state wants the river to restore species too, and those who rely on the river say that is too much to ask. San Francisco officials argue that the state plan could force their city to ration water. San Joaquin Valley officials have all but declared war on the state proposal, exposing uncertainties in the state’s predictions about fish populations and demonstrating that the state has underestimated the economic consequences of its approach. Such fighting over water in California, while hard, can be easier than making peace. Farmers, ranchers, anglers, environmentalists, Indian tribes, and other stakeholders in the far north of California (and southern Oregon) negotiated agreements to restore the Klamath River basin by sharing water and removing some dams. But the deals required the agreement of Congress, which can’t agree on anything. Now the players are trying to move forward by themselves with certain aspects of the agreements. Many Angelenos see a beautified, renewed [L.A. River] as the spine of nothing less than a new L.A. with new open space, denser housing, and more amenities for pedestrians, bicyclists and … boaters. At the same time, the Klamath and other northern rivers face new demands upon their waters, from the state’s fastest-growing industry: marijuana. Some cannabis growers have been drawing on water from the river—and letting waste end up in it illegally. The problem has gotten significant notice along Trinity and Humboldt county’s Mad River and nearby creeks, and the fight between two factions of greens—marijuana “trimmers” and environmentalists—has joined the bigger debate about the future of the northern-most part of the state. In Los Angeles, a big, complicated debate has erupted over competing plans to restore the L.A. River, the famous concrete flood control channel. Many Angelenos see a beautified, renewed river as the spine of nothing less than a new L.A. with new open space, denser housing, and more amenities for pedestrians, bicyclists and, on the river, boaters. But now that big money is on the table for river restoration, there are growing clashes between the river’s elite and grassroots champions over control. Rivers are a bigger part of the conversation elsewhere in urban Southern California. Ventura County’s tight development restrictions have allowed for restoration of the Santa Clara River, the closest thing Southern California has to a wild river, but parts of the river remain attractive for development. The 96-mile-long Santa Ana River, which runs from near Big Bear all the way to Huntington Beach, is a hot topic in three counties—Riverside, San Bernardino, and Orange—inspiring plans for parks, bike and equestrian trails, and riverfront economic development. Further south, San Diego has adopted a plan for a parkway along the length of the San Diego River, and efforts are well underway to make it a reality. That I’ve gotten this far without mentioning perhaps the most endangered and contested river in America—the Colorado—is testament to just how river-crazy we’ve become. Drought and climate change are crushing the Colorado, which already has been deeply diverted by agriculture, as well as Los Angeles, San Diego, and other cities of the West. 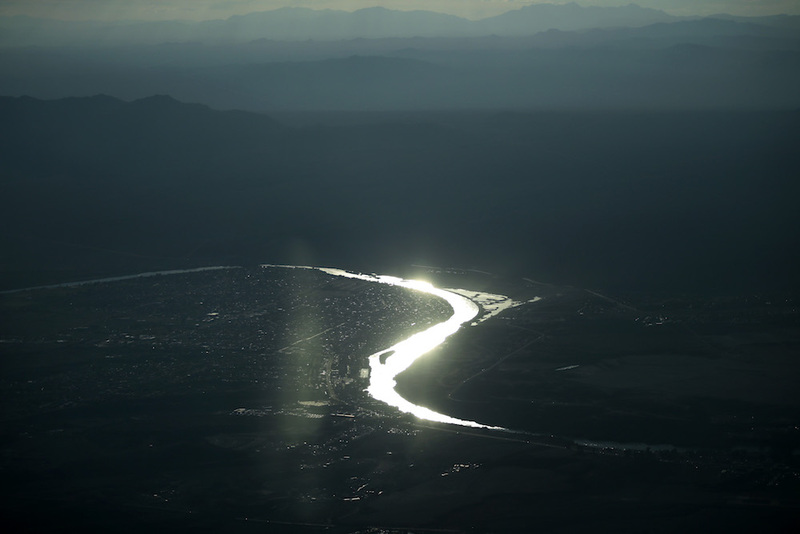 Development and industry still have plans for the river, and Mexico would prefer that the river not dry up before it reaches the Gulf of California. Of course, all California’s river dreams and duels could be roiled by the currents of the Potomac. Among his many outlandish campaign pronouncements, President-elect Donald Trump bizarrely denied that California is actually in a drought, while promising farmers quantities of water that defy all laws of nature. I suppose we’ll just have to cross that particular river when we come to it. *Photo by Jae C. Hone/Associated Press.